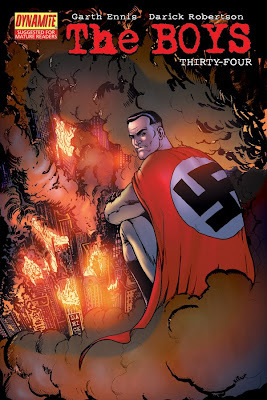 Stormfront: the super-nazi, the Aryan demigod, the worst of the Third Reich’s racial dreams come true… versus what’s left of The Boys. Can our ragged little band defeat this dreadful ubermensch? Will the Female ever awaken from her coma? Will the cavalry arrive in time, or ever? All this and more, in the bone-snapping, gut-rupturing conclusion to The Self Preservation Society. Welcome to The Supies, a night of glitz and glamour beyond any awards ceremony mere mortals could devise. Who will win Best New Team? Greatest Hero? Best Meat In the Sandwich? Exactly what is the Homelander hinting at in his acceptance speech? And in light of last issue’s developments, how do Vought American’s plans for the Presidency impact on the world of all things supe-ish? 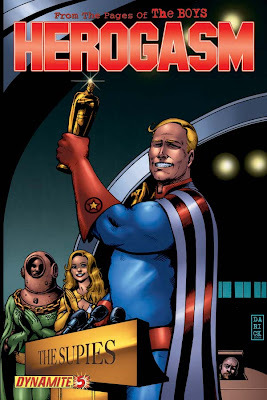 Find out in the penultimate episode of Herogasm.